Guest post: Assisi tour – am I ready? Angie Mitchell and her husband Ken will soon be leaving Australia for Italy, to walk with us on the Assisi tour. We’ll be meeting up in Florence, then taking a private bus to the Franciscan monastery at della Verna – where St. Francis experienced his stigmata – then walking 182kms through to Assisi. It promises to be a wonderful walk, although physically challenging at times. Angie and Ken came with us on the Camino Portuguese tour this time last year – and in the intervening time Jen and I have got to know them as very special friends. They’ve both been training for the tour – and Angie, being a writer, has put some thoughts down which I’m now posting as a guest blog. 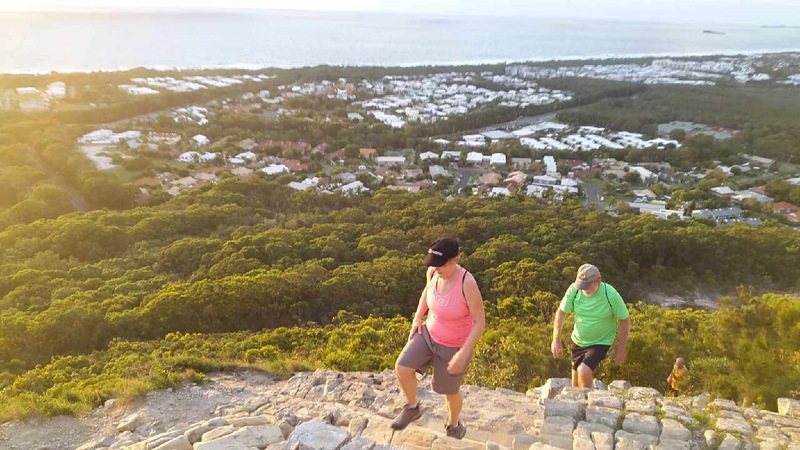 As we drove 5 km up the road yesterday morning at 5:45 for our regular walk up the little mountain at the Sunshine Coast called Mt Coolum, ‘Am I Ready’ kept playing in my head? Thankfully I was the passenger looking at this sizeable mountain and pondering on my readiness for the Via Di Francesco Tour starting on 27 April in Florence. Let me put it out there now, I am not anywhere near being a mountain climber, I don’t even like going up big hills and my goal in life was to go nowhere near any walk that looked like a hefty climb! I have always been very happy walking on reasonably flattish ground, even brashly boasting on my daily walks to any willing listener. It was only last year that Ken and I nosedived into long distance walking on the Camino Portuguese and despite sore feet and blisters I loved everything about the experience. It is funny isn’t it how easy it is to forgot any tough up hill trekking? But oh my goodness what I have done agreeing to go on this walk asks the fearful anxious side of my brain? Really Angie what were you thinking? Because you see, the looming walk in the Umbrian part of Italy has lots of steep inclines and declines and a good level of fitness is needed for pilgrims, says my friend Bill! It was when I saw a table detailing the distance and height for each day that I swiftly upped my fitness regime. I recalled that Bill talked about his brother Bob doing 100 squats a day as part of his preparation for his recent Camino Frances, so I increased my number of squats to 70 a day. That would surely strengthen my muscles in my thighs and get me up those high inclines of over 800m! And since I don’t live near Mt Misery, the name says it all doesn’t it, I decided that Mt Coolum would have to be conquered. Or better still my extreme reluctance to go up big hills would have to be overcome. It was definitely time to change my irrational thinking. There was no way around it. I told Ken we really need to include climbing up this mountain in the fitness plan. Ken’s reply “Aren’t our long distance walks enough” fell on deaf ears! My ever-patient good husband humours me by coming with me a few times a week. The great thing is that I have increased my fitness level and better still; I have overcome the fear I initially experienced at a scary section of uneven rocks. Yes, I have to confess I went down on my hands and knees, just for a second! Now I nearly jog at this point!! Sorry, I got carried away; there is definitely no jogging! I just have to be ready says my rational brain! D-day is coming at a fast pace. Everything else is organised; the backpack, the euros, the plane tickets and the hotels. I am ready to be reunited with my Camino buddies to have lots of chats about weird and wacky things, ready to walk on the paths that St Francis strode, and better still ready to enjoy the food and wine. And seriously, I will only know how ready I am when walking those steep inclines/declines, and slogging along the kilometres everyday. Hang on, maybe it is time to readjust the plan and walk up and down Mt Coolum every morning! Love your post! Although we aren’t going to be able to do Italy, we keep training a bit. Our favorite is about 8 km with some gentle hills. I would be dead if I had to climb the hill/mountain pictured. It looks like you need a handrail. Falling could be hazardous to your health!! Only five months until India! Doesn’t sound like as much walking but still need to get fitter. I think we need to step up our walks as well. Their is a tall mountain called Mt Si near us. (Bill remember the tall one that was visible from everywhere in North Bend (Twin Peaks)? Firefighters from around the region train there. Running up and down the mountain. It’s starting to be a little better weather here so maybe we’ll have to pack a lunch an attempt the top. Have a wonderful time in Italy. Have a few glasses/bottles of white port for me and see you in India)! Hello Linda, I am sorry that I will not be meeting you in Italy for this walk. Your 8km walk sounds pretty good to me. I think my regular climbing up and know Mt Coolum is due to sheer determination and drive, and also not having any of my walking friends needing to stop and wait for me to climb those hilly hills in Italy. Anyway Linda, going on these trips are great incentives to stay fit aren’t they and I agree the trip to India will require a level of fitness too. So good luck with trekking up Mt Si. Is it very high? Tried to upload a picture of Mt Si but it doesn’t appear to have loaded. Anyway it is tall, worse than going over the Pyrenees by far. Will be with you all in spirit in Italy! Britta, if I could suggest a rewording – enjoy Italy with the mad Pinterest pinner and her gorgeous husband! Oh Britta, That’s hilarious! From now own we should address him/them as such! Oi, I quite like the Swannies reference! Angie! WOW, I think you are ready ! have a wonderful walk, can’t wait to see photos of all of you and your Camino in Italy! There is always the ‘Bill the stocking man’ Britta and Lynda! Britta, I have considered the walking to and from Mt Coolum – just have not gone that way! Maybe a big oversight because just imagine how super fit I would be now!! Thank you kpschlesinger, I am sure Bill will be posting lots on his blog! Lynda, that mountain is very higher and much more challenging than our little mountain. Mt Coolum is suppose to be 900ft high, but the walking distance is less than a kilometre so it is very steep a lot of the way. Both walks appear exhausting. I have to start doing more walking/exercising and Mt Si is on our to so list as soon as it quits raining! Exhausting is a good word Lynda! You look ready to me!!! Same Donna, and you have given me a lot to think about my friend!! Good luck Angie, Ken and company. Will see some of you in September.